Fr Graham arrived in Berkswich in August 2017, after serving his Curacy (apprenticeship) in Bushey, Hertfordshire. Originally from Scotland, he moved to Stafford with wife Vicki and children Euan & Iona. You can contact Fr Graham by email or telephone 01785 251057. 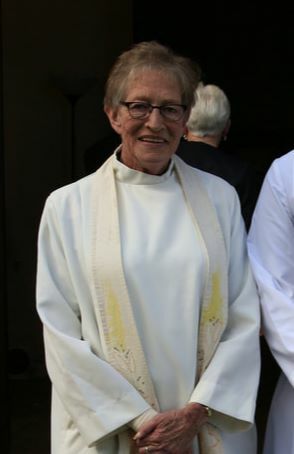 Having spent 30 years in nursing, she was ordained in 2001 and following her curacy in Penkridge came to serve in our parish in May 2004. Joy sees the important side of her ministry as being pastoral and journeying alongside people – she can often be seen speaking to passersby alongside the canal as she walks her little dog. You can contact Joy by telephone 01785 603074.